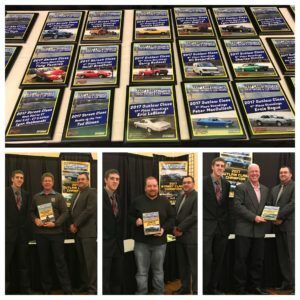 2017 Awards Dinner on 12/1/17. Bike Class Champion Jonathan Tisdale (bottom left), Street Class Champion Adam Lewis (bottom center) and Outlaw Class Champion Warren Wright (bottom right). Pictured with Race Director Dave Gagnon and Series Promoter Mark Caise. Gales Ferry, CT (December, 1 2017) – The New England Street Outlaw Series crowned its New London-Waterford Speedbowl Fast Lane Fridays Champions on Friday, December 1st at the Holiday Inn in Norwich, CT. Following an exciting 14 point event schedule it was Warren Wright in the Outlaw Class, Adam Lewis in the Street Class and Jonathan Tisdale in the Bike Class earning the title of 2017 Champion in their respective classes. 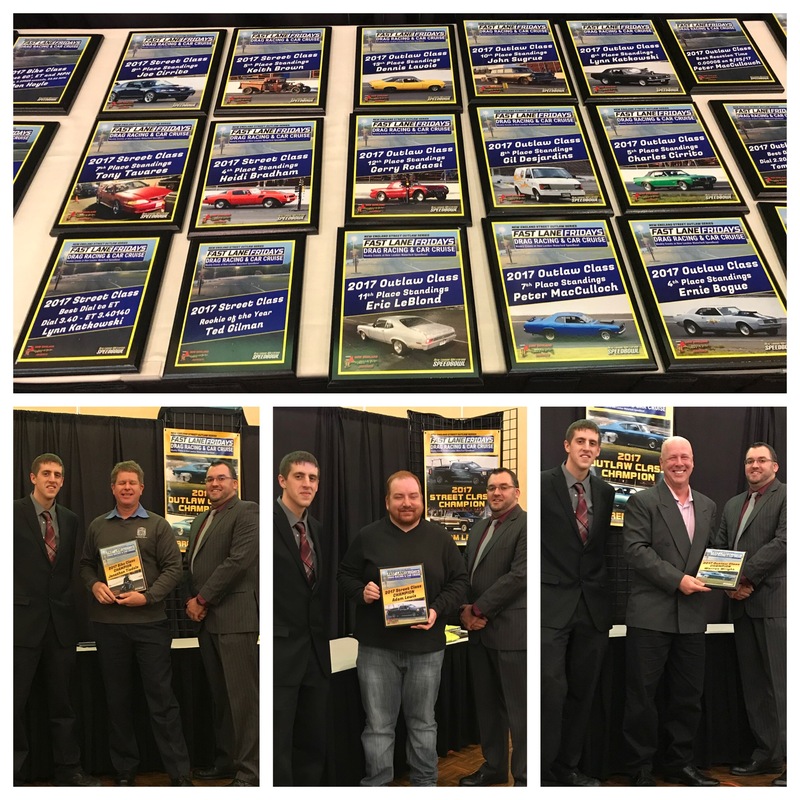 In addition to the champions the series honored the Top-15 in the Outlaw Class, Top-10 in the Street Class and Top-15 in the Bike Class as well as specialty awards. Warren Wright of Salem, who is now a 4-time track champion (2011, 2015, 2016, and 2017) in the Outlaw Class, earned his impressive third straight title by again running consistently week in and week out. The change from previous years was he retired his famous purple and white Chevy Malibu from Fast Lane Fridays following the 2016 season and instead chose to run his 1969 Chevy Chevelle. Wright would earn a total of five Eliminator victories in route to his fourth championship. Veteran racer Richard Dubina of Chaplin finished second followed by Tom Bischoff of Lyme, Ernie Bogue of Norwich and Charles Cirrito of Norwich rounding out the top five standing positions. Specialty awards in the Outlaw Class consisted of Best Reaction Time – Peter MacCullouch of Quaker Hill with 0.00006 seconds. Beast Dial to ET – Tom Bischoff of Lyme 2.20 seconds to 2.20027 seconds. Fastest 60’, ET and MPH went to Rick Taylor of Uncasville with a 15.60 MPH, 2.12173 ET, 57.22 MPH. Rookie of the Year went to Eric LeBlond of New Britain. Adam Lewis of Stonington had a remarkable 2017 season in the Street Class. Lewis at the helm of his 2014 GMC Sierra was able to win a Fast Lane Fridays high of six Eliminator victories. He would go on to find victory lane during the first five consecutive weeks of racing and would make it to nine Finale Rounds during the season. Lewis started racing at Fast Lane Fridays in 2014 and was also named Rookie of the Year. He has previously finished fourth in points in 2014 and 2015 and was able to improve to a third place standings finish in 2016; this will be Adams first Fast Lane Fridays Championship. Trevor Root of Old Saybrook would finish runner up to Lewis followed by rookie Ted Gilman of Jewett City in third, Heidi Bradham of Montville in fourth and Keith Brown of Griswold rounding out the top five standing positions. Specialty awards in the Street Class consisted of Best Reaction Time – Joey Bacon of Ledyard with 0.00559 seconds. Beast Dial to ET – Lynn Katkowski of Westerly, RI 3.40 seconds to 3.40140 seconds. Fastest 60’, ET and MPH went to Mark Green of Waterbury with a 17.19 MPH, 2.3866 ET, 45.86 MPH. Rookie of the Year went to Ted Gilman of Jewett City. Jonathan Tisdale of East Hartford claimed his first Bike Class Championship this season after multiple seasons of running a partial schedule. Tisdale is no stranger to drag racing; he has been competing for over 37 years at tracks all over the country, primarily Lebanon Valley Drag Way in upstate New York. After a slow start during the first few weeks of the season Tisdale would find his grove and post impressive, consistent reaction times during the course of July and August that lead him to a class high five wins. Deanna Brockett of Salem would finish runner up after collecting two wins. Former series champion James Tedford of Deep River finished third, Nathan Booth of Quaker Hill finished fourth and long-time racer Jenna Barba of Branford rounded out the top five standing positions. Specialty awards in the Bike Class consisted of Best Reaction Time – Cole Booth Wililams of Niantic with 0.00110 seconds. Beast Dial to ET – Cole Booth Williams 3.86 seconds to 3.86026 seconds. Fastest 60’, ET and MPH went to Ron Hoyle of Baltic on his snowmobile with a 16.20 MPH, 2.20529 ET, 53.62 MPH. Rookie of the Year went to Jonathan Booth of Quaker Hill.